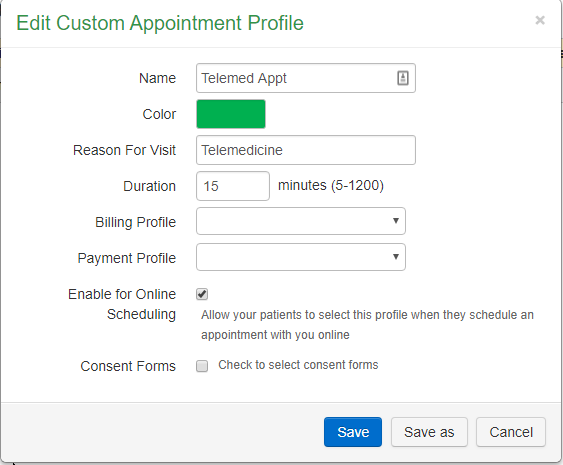 Creating a telemedicine appointment profile in drchrono can be done in 4 easy-to-follow steps! Hover over "Schedule" at the top and click "Appointment Profiles". Tip: If you don’t have the “Schedule” or "Appointment Profiles" link, it’s most likely a permissions issue. Contact your practice administrator for more assistance. In the upper right side of the screen, click "Add New Profile". All details are customizable to your liking, with the exception of the Reason for Visit field, which must be Telemedicine. Tip: Click the "Enable for Online Scheduling" box to allow your patients to request Telemedicine appointments via your online portal. Reminder: Don't forget to link your drchrono account to Chiron Health!